Gmail but now it doesn't show the "Gmail" option anymore. when I was low on storage space : could this be the reason? Instead when I tap on "Email" will get to the 2nd attachment's screen which says "No email was set up" : previously it was set up & there. Hmm, I think I uninstalled Gmail app & disabled a couple of apps when I was low on storage space : could this be the reason? I think you're right on the money. 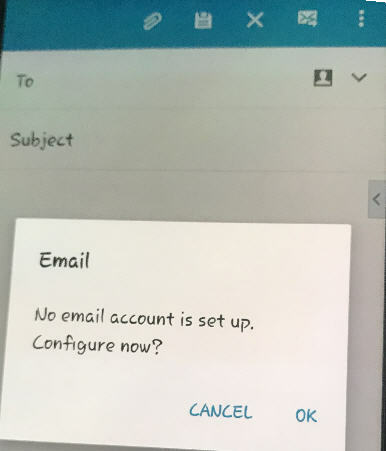 Where you are prompted to configure (set up) an email account as per 2.jpg, tap OK and enter your Gmail email account details. 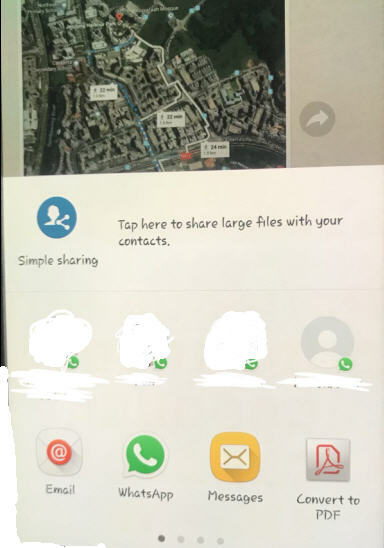 Also, with the 1.jpg screenshot that you uploaded, I assume you've tried sliding to the left to see if the options you're missing aren't there? The three dots at the very bottom of that screenshot mean there are more items to view, just that you need to slide to the left to see them. Got it working after installing back Gmail app. What about the beeping notification sounds? How do we trace it comes from which app(s)? Glad to hear you got it working sunhux. As for the beeping notification sounds, that can be adjusted in Settings. The steps are different depending on the version and model of your Android phone, however, they will be there. You can choose different sounds/beeps for different apps, or disable those types of notifications completely. Thank you for closing your question and I was pleased to be of some help.